From the very beginning Carmelites have had a special place for Mary in their lives. When they first gathered on Mount Carmel in the early part of the 13th century they named their chapel in her honour. Doing so was a sign of their belief that Mary would accompany them in their life in Christ. Perhaps they were inspired by the image painted by St Luke in the Acts of the Apostles of Mary gathered in prayer with the disciples (Acts 1:14). They also called themselves ‘the brothers of St Mary of Mount Carmel’. To the later medieval Carmelites, Mary was ‘the Lady of the Place’, a guide and protector. Like many others of their time, they wrote stories about the things that were important to them. Like all legends, these stories weren’t concerned with historical facts, but with describing their spirituality, way of life and their relationships with significant people like Mary and Old Testament Prophet Elijah. One of these stories, written in 1391, talks about Mary as the sister of the Carmelites. It even describes her frequent visits to the early Carmelites on Mount Carmel. Though this is historically impossible, the message of the story is to describe the special quality of the Carmelites’ relationship with Mary and her importance in their lives. Carmelites see Mary as a model and inspiration for their way of life. The Scriptures show her as an individual who was deeply in touch with the mind and heart of God, a real contemplative. People like Mary draw God into their lives and allow God to draw them into His. To be a contemplative person doesn’t mean to live in splendid isolation from the hopes, needs and desires of others. Carmelites also see in the stories of Mary her visit to her pregnant cousin Elizabeth, her concern for the newly married couple at Cana, her companionship with the disciples after the death of Jesus, the inspiration to be of service to others. Mary was at once a contemplative and a woman of service. Like the early Carmelites we also feel that Mary is like a sister to us, accompanying us as we journey in Christ to God. Mary shows us how to be real disciples of her Son, people deeply involved with God and with God’s people. The Feast of Our Lady of Mount Carmel is celebrated on 16 July. In celebrating the Feast of Our Lady of Mount Carmel, the Whitefriars Community gathers over the course of a week to acknowledge this important feast day in the life of the Carmelites. A Mother and Son Mass, and Year Level Masses are held over the course of the week, which enhances the students understanding of why the day is an important part of the College’s Carmelite identity. Social activities, such as rides, comedians, laser tag, a magic show, barbeque, food stalls and band performances, as well as fundraising activities, such as the annual walkathon, provide an opportunity for students to interact with others in their House and also to reflect on the hardship people experience in East Timor. 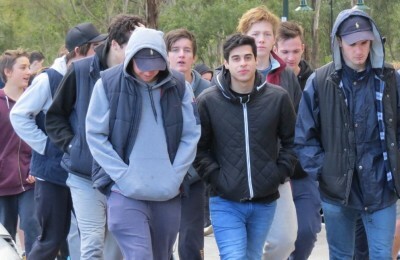 The boys are very committed to their part in the supporting the Carmelites and the work they do in East Timor and they and their families donate generously to the cause.